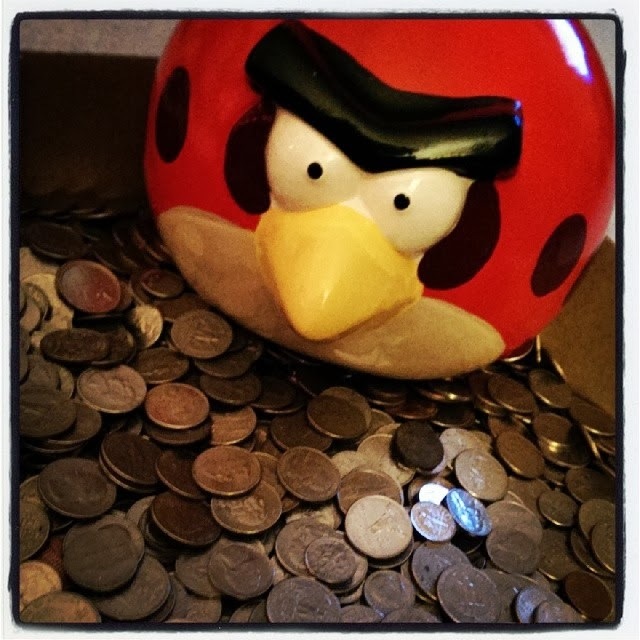 My Angry Birds piggy bank emptied. It all adds up, and it all goes in my piggy bank. Whether the bank is in the shape of a pig, an Angry Bird or Coke bottle, it is a place to squirrel away a little money for something special. Every year, right after Christmas, I empty out my piggy bank, count and roll the change while watching holiday movies. And then, I start filling it up again. I like to use the change for a nice trip (this year it covered my airfare to sunny Phoenix). One word of caution, if you need quarters for laundry or frequent areas with parking meters, you may want to hold some of that change back. Otherwise, enjoy something great with your forgotten change.